The Lean Startup movement has spread like wildfire. Eric Ries’ book by the same name has inspired a whole generation of smart entrepreneurs who are getting early customer feedback on Minimum Viable Products (MVPs) so they can decide whether to pivot or persevere. 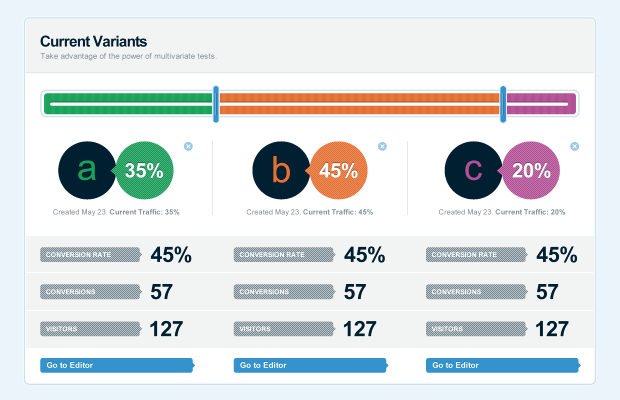 But what if you want to test customer demand before even building a minimum viable product? What if there was a way to create a sort of minimum viable product without actually creating a minimum viable product? But first, a little background on the Lean Startup movement. The startup entrepreneur has become a mythic figure in the 21st Century. Business icons such as Steve Jobs or Mark Zuckerberg are seen as visionary innovators who create great ideas, and then build lasting companies based on these ideas. The idea of the visionary business leader with future-predicting super powers is a myth. Eric Ries debunked that myth in his book The Lean Startup. Ries recognized that most startups ended in failure. Countless investors and founders bet time and millions of dollars into visionary products that nobody wanted to buy. That innovate idea that the heroic entrepreneur and his team of dedicated engineers developed in “stealth mode” typically gets shattered into a million pieces on the ragged rocks of reality. That reality is the customer, who didn’t want that innovative product. Ries recognized that the real success stories come from entrepreneurs who produced an initial product, introduced it to the market, and found out their product was a total failure. Undaunted, these entrepreneurs went back to the drawing board, and either tweaked their offering, or tossed it and created something completely new. Key to Ries’ Lean Startup methodology is the creation of a minimum viable product (MVP). This is a product that has just enough features and functionality to offer an initial group of customers in order to gauge demand, because the goal of a startup is to figure out the right thing to build. To find out as quickly as possible, what customers want and are willing to pay for. To offer a minimum viable product, you actually have to build one.This can take a weekend, or it can take 3 months. But if you’re short on time or financial resources, you might want to consider a pre-MVP. The landing page is the perfect pre-MVP. It allows you to offer your product concept on the web, test your product’s value proposition, and see if your product idea is on the right track. That’s precisely what Eric Ries did as CTO of his startup IMVU. In this blog post Ries describes testing a new product feature add-on that was appropriate for election season (during the 2004 election that pitted John Kerry against George W. Bush). So how do you structure your landing page to test your product idea? We’re going to provide an example from an experiment we recently launched during a recent startup weekend event in Austin, TX. Lander product manager Nico Roddz conceived of an idea for a web form analytics solution and created a landing page to sell it (you can see it here: http://www.formtuner.com/). He promoted the landing page using a brief PPC campaign, and through social media sharing. In the span of 24-hours he had generated 19 leads for his fictitious product. He describes a value proposition as having a compelling headline (as we show above), a 2-3 sentence sub-headline, 3 bullet points and a visual representation of the product or concept. Then we featured a compelling image, and below that we placed our three bullet points horizontally below the image. If you want to actually gauge customer demand, you need to try to sell to potential customers, or at least have them show buying intent. How do you get clients to show buying intent? You need a call-to-action. A call-to-action can be a “Buy” button, a 1-800 number, or an online form. Our call-to-action was a prominent sign-up form. Did it work? You bet. We had 19 sign-ups after one day on the market! People get confused between a call to action and an offer. What is an offer? An offer is a specific promise of value in exchange for something else of value. Your product (or the promise of your product) is not an offer. Your value proposition and call-to-action are not the offer. An offer is something very specific that your customers will get right now. 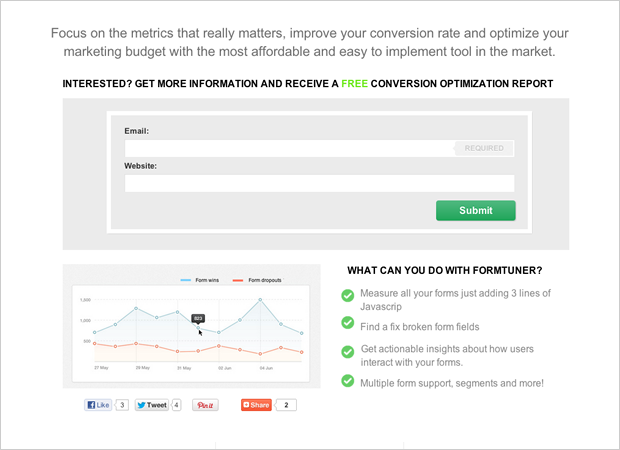 In our test we offered a “free conversion optimization report”. A free report, white paper or eBook is usually offered for products or services with long sales cycles. You’re asking your client for their email address so you can continue to communicate with them via email. In exchange, you’re offering them valuable information that can help them in their everyday life. Another type of offer could be: “Buy now and get 7 free hours of videos.” That’s a product offer. It’s time-specific and provides an extra bonus to entice customers to buy now. “The Offer” is such as big deal that marketer Mark Joyner dedicated a whole book to it called “The Irresistible Offer”. When using a landing page as a Landing Page MVP to test your product idea, you should also test different versions of your landing page. This allows you to isolate what elements of your minimum viable product are attractive (or not) to your potential audience. Serve up two or three different versions of your landing page. Isolate what you’ll change: focus on your headline, your value proposition, the offer or the call-to-action. If none of the versions of your landing page do a particularly good job of attracting prospects, then it’s a safe bet your product idea is not really viable. Time to think of a different product idea. If, however, you’re able to see a big spike in conversions from one version of your landing page to the other, then you should keep on testing so you can improve the winning version of your landing page. You might just have a hit on your hands! Using a landing page to test your product or service idea is a great way to save time and will keep you from building a product that nobody will want. It’s a version of the MVP, but a much reduced version. It’s a version that’s not actually functional, but it does the job of testing your idea because you’re offering it to real customers in a real business environment. The Landing Page MVP tests your product idea and messaging, and can help you decide whether to build an initial version of your minimum viable product, or build a different minimum viable product than what you actually intended. What is your experience? Have you ever built a landing page to promote your MVP before building it? What’s been your experience? What do you think makes for an effective landing page to determine demand for your future MVP? Would love to hear your comments below!